"I've got to learn how to budget!" How many times have you said that to yourself? You want a really simple personal bookkeeping plan, or some sort of system that just takes a few minutes at a time, and keeps everything organized for you. You may hate math and working with numbers, so you want something hassle-free that will keep track of your money and help you know at a glance what you have, and how much to expect to come in. Or, even how much you have fallen short - before it is hopeless! Budgeting is really setting down on paper how much money you can expect to come in, and when, and how much you need for your lifestyle. It's a blueprint, a plan. Then if you stick to the plan, things balance out nicely and you don't have to be afraid of bill-collectors. A personal budget for say, a child, might be nothing more than deciding that "out of every bit of money I get, half will go into a savings account for a bike. The other half I will split between snacks and treats for myself, and another part will be for treating friends." On the other hand, a teen with a paper route who makes $300 a month, may make a budget that involves portions for savings, hiring subs to take route when he is not well enough, school supplies, a tithe for church giving, and a portion for dates, and another for personal treats, or hobbies. If you have a small business, you may need to learn how to budget on a more complicated scale, with income categories like commissions, and then expense categories like; taxes to turn into the government, cost of buying products, or making them, the advertising expenses, rent for storage space, maybe shipping costs too, and then the part that you can spend on yourself - your profits. There are many software programs that offer to show you how to budget, but if that scares you, what could suit you better than a simple accounting book into which you could write the the amounts you receive, the amounts you spend, and the totals? The Color of Money is exactly that kind of accounting book for an individual's, or a family's bookkeeping. It is simple enough for a 10 or 12 year old child to use and has enough pages for just one year. The Color of Money is a modern book with a bare bones budget outline. Just perfect for those who have never done any personal bookkeeping before, or have been afraid to buckle down and do it. Send me $25/per book by PayPal. Just make sure to include your mailing address and contact info. If you have any questions, here's how to reach me. Generally we think of adults doing the family bookkeeping, but having tried this The Color of Money book, I believe it is easy enough to train a child to record their accounting. In fact, you might promise a son or daughter a raise in allowance, if they will first use this method for a year. A child that learns how to budget and do simple accounting early on, will be far more likely to be self-disciplined with money all through life. I used it as an adult caregiver for my parents' bookkeeping in their old age, as they had never learned how to budget like this, although I suspect my Mom did some of that in her head. Are your finances out of control" Everyone seems to be telling you to BUDGET? Then this very simple accounting book will guide you and teach you how to budget. Have you ever signed up to become a network distributor for some great products? At that early stage you are stuck doing all your business bookkeeping yourself, but you know you should keep your business records separate from your personal finances. This small business accounting book, The Color of Money shows you how to budget for your business, how to file receipts, and how record every item, and keeps everything in one place for one whole year. I assure you, once I got a comfortable pattern of doing my small business bookkeeping, I was able to relax and stop getting headaches over it! You could too! As a Pioneer Girls Club leader I kept a steno pad book to record the "shares" that the girls brought in, and what expenses I had for the crafts and activities we did. There my budget was simple: don't spend more on supplies than what is in the Shares bag. But every December I had to turn in my book to the auditor before the Annual Meeting, and I was embarrassed at my pathetic account book. Sure wish I'd had The Color of Money! Let's talk a bit more about how to budget. Do you have a problem of once-a-year bills showing up, but you are not ready for them? You knew they were coming, but - huh? It didn't connect that you might have to save up for that annual bill. It happens to me with house and car insurance. I have had to learn to budget! If you just don't have enough income to cover ALL your expenses, you do have a big problem. Will knowing how to budget solve that? Recording incomes and expenses in an accounting book doesn't make more money appear - that's true. But it does something else for you. It reveals where money is leaking out of your life, that would not need to; you can stop that leak and there will seem to be more left over for expenses. It also helps you to spot where you have been spending money on things that you could give up. Suddenly they don't seem so necessary. For instance, do you HAVE to go see movies? Quitting some things like that, can leave more for the essentials like rent or mortgage, groceries, utility bills, and insurance. In this way, a budget can be improved, and you can revise it to make it more balanced. Juggling expenses is often a key part of how to budget smartly. You will feel especially smart at your skills in how to budget, when you can start entering categories for things your heart desires! It's all about planning your priorities wisely, and putting that into your budget plan. Once you know how to budget (plan) your income and expenses, you will be managing your money instead of it managing YOU! The Color of Money will help you with that. It is a daily financial record book and budget planning guide. One year at a time. Could you make yourself stick with this for one year? That could be enough to turn your life around! Learn how to budget and you can gradually pull yourself out of debt and then vow never to live in the negative (debt) world again. That's just way too hard on the nerves and your health. Personally, I'm convinced that if you live with a beggar mindset you will always be poor, and NEVER become wealthy. To pull yourself out of poverty by your bootstraps you need to learn to manage small incomes well, make plans, work the plans, and earn your way up while thinking "What can I give?" instead of "What can I get?" Sure, there are computer software programs that allow you to do this kind of personal bookkeeping or small business accounting too on your computer. Some of them are free. I use a free one now called, KMyMoney. But I still like to record things on paper books too - just because I need to see things laid out simply so I can understand them. The Color of Money is simple like that. If you want to train your children to be wise in handling their allowance, this accounting book, The Color of Money is just the thing you need. Some of the column headings would not apply to them, such as household and utilities, or wage deductions, mortgage, etc. But there's an easy answer for that. Just cross them off and write above them what the child does need a column for. A child or teen who learns how to budget and plan their spending will not have to learn these key life lessons from the school of Hard Knocks (experience). 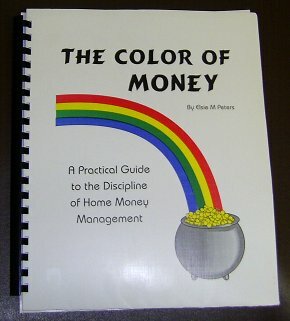 Our Aunt Helena ordered a batch of The Color of Money to give to her grandchildren one Christmas for exactly that reason. What a great idea! Do you teach a class of children or young people, or perhaps new immigrants? Would a short course in how to budget and how to use a personal or family accounting book be appropriate? 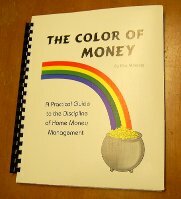 This book, The Color of Money would work very well, and at a much lower cost than many other text books would be. The Color of Money is a paper, cerlox bound one-year accounting book with very simple instructions so that you can draw up a budget and keep a record of your incomes and expenses. You record your receipts and pay stubs and slip them into envelopes (even used ones) in the cover pockets. If you put it in a regular spot and make your entries each day or week, it will tidy up a large part of your struggle with bookkeeping. It won't make you wealthy right away - but it can prepare you for such a future. $ a simple business accounting and bookkeeping plan. $ to teach children how to do simple accounting. You need it for one or more of those reasons? Then, order a copy or two right away. It's ideal to begin at the beginning of January, but you can start any time of the year. (If you start later, just begin on that month's page and when done with December start using the pages for the earlier months that you missed). Buy Now Button: PayPal. Include your mailing address and contact info. Don't really trust online shopping yet? Sign up for my free email course that explains things in greater detail.